Real Madrid played the Santiago Bernabéu trophy this Wednesday night and despite having had a game for La Liga just two days ago, the Merengues hosted and beat the Colombian side Millonarios, with a smashing 8-0 result. Cristiano Ronaldo was given a precious rest, just as it happened with a few other key players like Pepe or Xabi Alonso. 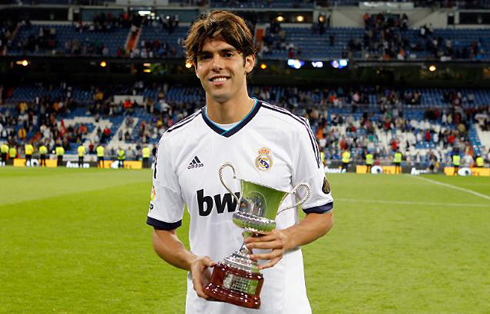 Kaká with an hat-trick, Moratta and Callejón with a brace each and Benzema with a single goal, ensured that the Santiago Bernabéu trophy would remain at home this year. Cristiano Ronaldo didn't step up to the pitch last night at the Santiago Bernabéu, but Real Madrid took this friendly game against Millonarios very seriously and ran over their opponents with an impressive 8-0 victory. Kaká finally had an opportunity to play some minutes this season and showed José Mourinho that he can still be seen as a reliable option for the challenges that are about to come ahead over the next weeks and months. The Brazilian signed an hat-trick and also saw Morata and Callejón scoring two goals each. The French striker Karim Benzema sealed the deal for the Merengues, after scoring the last goal, in what was an easy game for José Mourinho's men. Real Madrid approached this game with several 2nd and 3rd choices on the line-up, but that didn't mean that Millonarios got their mission made any easier at all. Extending the recent streak of games where the Merengues have shown a good attitude when facing theoretically weaker opponents, José Mourinho's men came to this match with the right mentality and seeking for goals no matter what the result was. The first half ended with a 5-0 result in favor of the Merengues and it didn't seem like Millonarios had enough strengths or talent to start countering Madrid favoritism during any stage of the game. 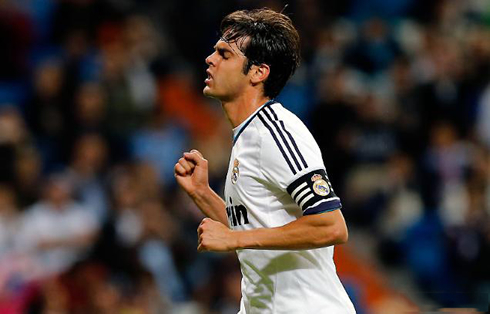 Two goals from Kaká (on the 13th and the 37th minute), as well as two from Morata (32nd and 37th minute) and one from Callejón on the 23rd minute, gave Real Madrid a comfortable 5 goals lead at half-time. Near to 30.000 people were present at the Santiago Bernabéu and witnessed in first hand to three more goals during the 2nd half. José Mourinho made a few changes, brought in first team players like Benzema, Ricardo Carvalho and Modric, but also gave the opportunity to the likes of Mosquera, Fabinho or Cheryshev. The team naturally slowed down a bit with so many changes occurring in the game, but there was still enough time to add 3 more goals to the count. Kaká completed his first hat-trick with a Real Madrid jersey after scoring from a penalty-kick around the 60th minute and saw his goal being followed by another from Callejón, as well as a nice finish from Karim Benzema, close to the 80th minute. The game ended with a clear 8-0 on the scoreboard and Real Madrid lifting the Santiago Bernabéu trophy at home. Since Cristiano Ronaldo played the full 90 minutes against Rayo Vallecano on Monday, José Mourinho decided to not risk playing him tonight, especially with another important Spanish League fixture right next Sunday, as Real Madrid will prepare to host Deportivo de La Coruña. Cristiano Ronaldo's next game for Real Madrid will be against Deportivo de La Coruña, next Sunday (30-09-2012), for the Spanish League 'La Liga'. You can watch Juventus live stream, Arsenal vs Chelsea, Sevilla vs Barcelona, Manchester United vs Tottenham and Norwich City vs Liverpool, all matches provided from our football live streams section.